Kuta Beach Sea Turtle Conservation Centre is a conservation program to protect sea turtle eggs laid on Kuta Beach and increase hatching rates. We relocate sea turtle eggs laid in the sand on Kuta Beach to a central hatchery. The eggs take 47 - 60 days to develop and hatch. When the baby sea turtles hatch we want to return them to their natural habitat quickly. We release the baby turtles into the ocean the as soon as posible. You can join in the baby turtle release. The baby sea turtle release begins at the Kuta Beach Sea Turtle Conservation Centre. In front of the Hard Rock Café, walk onto the beach, turn left and walk on the path for 100 metres. We are next to the Lifeguard station and Kuta Beach Security office, Look for the giant turtle statue! Everyone is welcome to join in the baby turtle release. We welcome local and international visitors to share the experience of the baby sea turtle release for education and awareness of sea turtle issues. On the days we release baby sea turtles, we gather in the afternoon. The release process takes about 30 minutes. 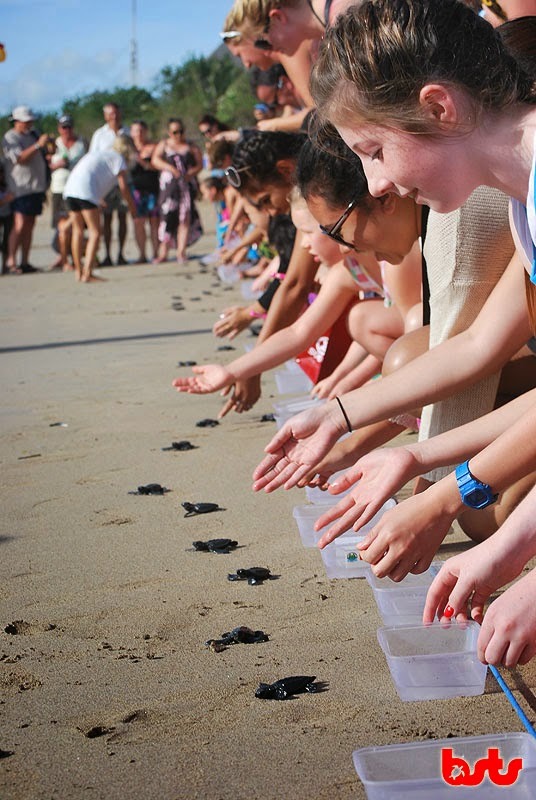 It is free to visit the Kuta Beach Sea Turtle Conservation Centre and to join the Baby Sea Turtle Release. Donations are Welcome and greatly appreciated.